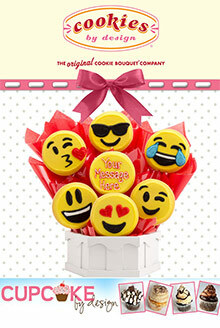 Cookies by Design, the original cookie bouquet company offers delightful and delectable gifts. Choose a hand-decorated cookie bouquet and/or freshly baked gourmet cookies to celebrate any occasion and celebration. These delicious gifts can be hand-delivered and are sure to please. Cookie Boutrays, Baskets and Gift Trays - Pump up the cookie factor by combining their famous edible bouquet with a tray of gourmet cookies for a unique gift called a BouTray. These beautiful gifts go a long way and are big on wow factor. For a smaller gift but just as tasty, choose a cookie gift basket or tray. Each of the decorated sugar cookies are big and beautiful, weighing 4 oz. and measuring 4 to 6 inches in diameter. Add a personalized message that says "Thanks a Bunch!" or "You're Blooming Wonderful!" and you've made someone's day! Cookie Cakes - Giant gourmet cakes made with freshly baked cookie dough are perfect for sharing around the office or at a party. Order one decorated for a birthday, baby shower, Valentine's Day, or graduation party. These are also the perfect bakery gift to send to an office. Everyone who tastes their wonderful cookie sheet cakes celebrates with a smile. Corporate Gifts - Cookies by Design offers corporate clients a program to give delicious and memorable gifts that can be delivered nationwide. Whether you want to thank customers or employees, gain new business or send a gift for the holidays these unique gifts are sure to make a lasting impression. You can even customize the gift with your company�s logo, mascot or even your business card. With the help of a Corporate Gifting Specialist, you have a one stop shop to handle all of the details, offer recommendations to fit your needs and budget. You will love the savings with the Cookies by Design coupon code when you order their handmade, freshly baked and individually decorated gifts. If you need to place multiple orders they can deliver to multiple locations, and also offer a Corporate Gift Program for business customers who need to place more than one order.